Feel free to continue reading but just be aware that the technique described here is extremely outdated and the code that follows is garbage and as far from PowerShell coding best practices as possible. My Invoke-Shellcode script which is part of the PowerSploit project is vastly superior to this garbage proof-of-concept code. 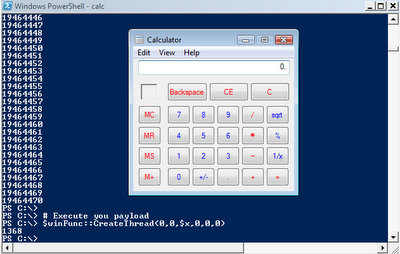 Using the features built in to Microsoft Powershell one can execute arbitrary shellcode. The method described in this post is both 32 and 64 bit compatible. Because we are exploiting the features of the .NET framework, ASLR and DEP doesn't even come into play here. Just copy and paste your shellcode and you're good to go. Those us that use Powershell know just how powerful it can be in automating administrative tasks. However, with great power comes great responsibility and the Powershell developers certainly assumed that it would be used responsibly. Unfortunately, (get ready for another clichéd expression/pun) absolute power corrupts absolutely. 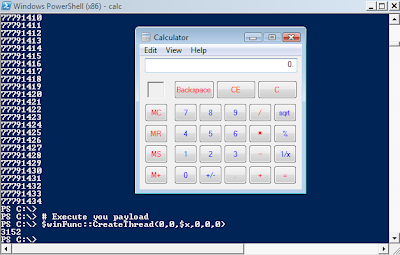 ;D I'll show you how you can use Powershell's integrated features to execute arbitrary shellcode. Powershell's true power comes in the form of access to the .NET framework. One of the greatest features of Powershell, IMHO is the ability to add custom classes to the .NET framework. This can be accomplished using the Add-Type cmdlet. The great thing about Add-Type is that it will compile CSharp code on the fly for you. Why is this so great? It allows you to import functions from any DLL. The Add-Type documentation provides some pretty good examples on how to create your own classes using CSharp source code. It's pretty easy to import a function from a DLL. You just have to alter the C-style function prototype a bit to a CSharp-style prototype. Since we'll be importing the VirtualAlloc function later, I'll use it as an example. Disclaimer: This code is provided for academic purposes only and should not be used for evil. You are liable for your own actions. # Copy and paste your shellcode here in the form 0xXX. # Allocate a page of memory. This will only work if the size parameter (3rd param) is at least 0x1000. # I could have more easily used memcpy but that would have required the use of a particular .NET class to cast $sc as an IntPtr. I wanted to get this working without needing additional .NET classes. I prefer to KISS (keep it simple, stupid). Now if you wanted to be even more stealthy in executing this attack, you could base64 encode the entire payload and execute it using the '-encodedCommand' option in PS. You could take this one step further and execute the encoded payload within a batch file thus bypassing the Powershell execution policy. I'll spare you details on how to accomplish this since this method is already well documented. Lastly, I am by no means a CSharp developer or even a developer for that matter so you can certainly spare me any criticisms of my poor coding practices. The bottom line is, it works and it works extremely reliably and that's all I care about. Also, there's absolutely more than one way to accomplish this. I would love to hear suggestions on alternate ways to execute shellcode from within Powershell. And please feel free to leave comments and questions below. Enjoy!